Each year, nearly 4 million infants around the world die due to respiratory complications. To end this tragedy, Ballard Center students are competing in the Y-Prize Newborn Challenge to improve and market a BYU-engineered, low-cost infant ventilator and CPAP that gives local doctors and hospitals a tool to fight this health crisis. At the start of the year, twelve student teams began the competition to develop viable business models to eventually distribute the respirators worldwide. After the first round of judging, eight teams Team Members: Kadie Kovach, Margaret Melville, Annica Cooper, Adrian Glover, Figgs Hofheins, Deana Mugimu, Bryan Stringham, Ethan White were eliminated and the remaining teams traveled during the summer to India, Uganda, Rwanda, or Cambodia to test the market and learn more about the local needs. With the Y-Prize Newborn Challenge now down to the final three teams, it's a race to the finish to determine who will win the $75,000 in funding and rights to the device to be able to create a social venture to save infants. Check out each team and decide for yourself who has the best shot at winning the competition! Why Uganda? Kadie: "The really interesting thing about Uganda and Africa in general is that Africa accounts for 50 percent of the neonatal mortality deaths around the world. The majority of those deaths occur in the region surrounding Uganda, and the infrastructure is there to give the machine the potential to be successful." How was your trip to Uganda? Margaret: "It was a really good experience. We worked with a nonprofit called Safe Mothers, Safe Babies that has relationships with all the hospitals and clinics and helped facilitate our visits and meetings with doctors and administrators. 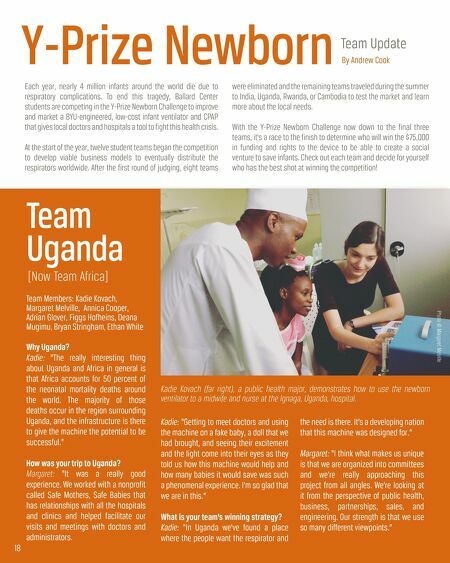 [Now Team Africa] Kadie: "Getting to meet doctors and using the machine on a fake baby, a doll that we had brought, and seeing their excitement and the light come into their eyes as they told us how this machine would help and how many babies it would save was such a phenomenal experience. I'm so glad that we are in this." What is your team's winning strategy? Kadie: "In Uganda we've found a place where the people want the respirator and the need is there. It's a developing nation that this machine was designed for." Margaret: "I think what makes us unique is that we are organized into committees and we're really approaching this project from all angles. We're looking at it from the perspective of public health, business, partnerships, sales, and engineering. Our strength is that we use so many different viewpoints." Y-Prize Newborn Team Uganda Team Update By Andrew Cook Photo © Margaret Melville 18 Kadie Kovach (far right), a public health major, demonstrates how to use the newborn ventilator to a midwife and nurse at the Ignaga, Uganda, hospital.